The St Kitts Nevis Passport CBI program has been an overwhelming success but the government worries that with the minimum of $250,000 it may be too expensive for many clients and that a cheaper more affordable alternative is needed to keep passport sales at a brisk pace. Not wanting to tarnish or devalue the existing program, the acting assisting junior deputy manager of the CBI program Dr. Eric Zales has announced their plans to offer more affordable options for those who are not wealthy. To achieve this Parliament has introduced a bill which would separate Booby Island and Cows rocks into a separate nation but still under control of St Kitts and Nevis, essentially making it an “overseas territory”, similar to how Anguilla relates to the United Kingdom. This will allow the CBI program to issue passports without the same benefits of a full St Kitts & Nevis passport and at a much lower cost. As real estate on Booby Island and Cows Rocks is extremely limited, no real estate option will exist. 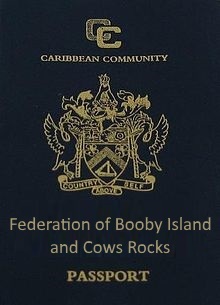 Holders of the newly issued passport to The Federation of Booby Island and Cows Rocks will have visa free travel throughout Caricom which as small as it seems is very attractive to many people in third world countries.